Please note: If you have signed up for Quickbooks after Nov 10 2017 we will not be able to support your export due to the AST (automated sales tax) in Quickbooks, which selects the tax automatically, based on the address set on your invoices. This is making it impossible for us to map taxes from within Operate. Connecting Operate and Quickbooks online makes your bookkeeping easier. In this guide, we will go through a set of instructions that will allow you to export your Operate data directly into Quickbooks. The following configuration is using GL codes in Operate and Account Category Type Names in Quickbooks to match data. Your Operate GL Codes must be identical to your Quickbooks Account Names in order for the export to integrate correctly. You can use numeric GL codes if you like; however, this is not mandatory. If your Quickbooks Category Type Name is using text, you can copy it as-is, as a GL Code in Operate. 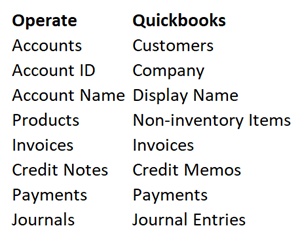 Mapping the Quickbooks Accounts and Operate GL Codes Used by Payments and Journals. Mapping the Quickbooks Accounts and Operate GL Codes Used by Products. Configuring customer payment types and terms. What and How is Mapped? Below is a list of exported items from Operate and what they match to in Quickbooks. Please take note of the different terminology in the two systems, which refers to the same information. 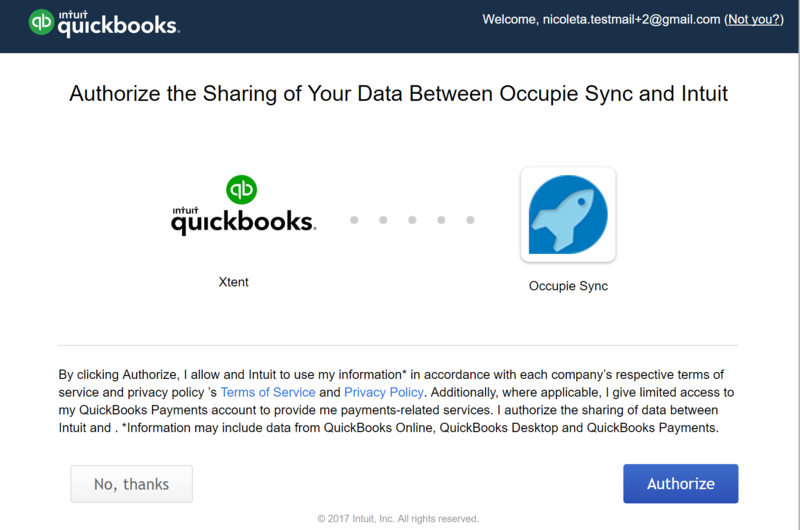 If there are Operate products with the same name, they will all match to a single Quickbooks item. Operate’s products are exported as non-inventory items. Invoices and Credit notes are mapped from Operate by document number. Payments and Journals are mapped by ‘Memo’ where Quickbooks stores Operate’s transaction ID (This should not be modified). First, please ensure that your tax rates are configured between Quickbooks and Operate. 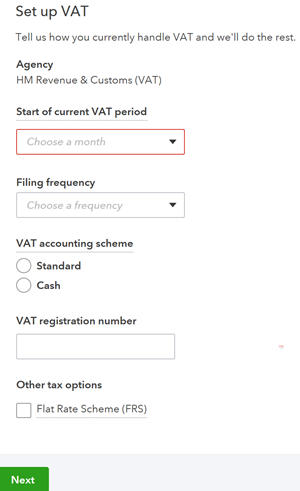 Next, you can start adding your tax rates. In Quickbooks, go to the Taxes section and click New. 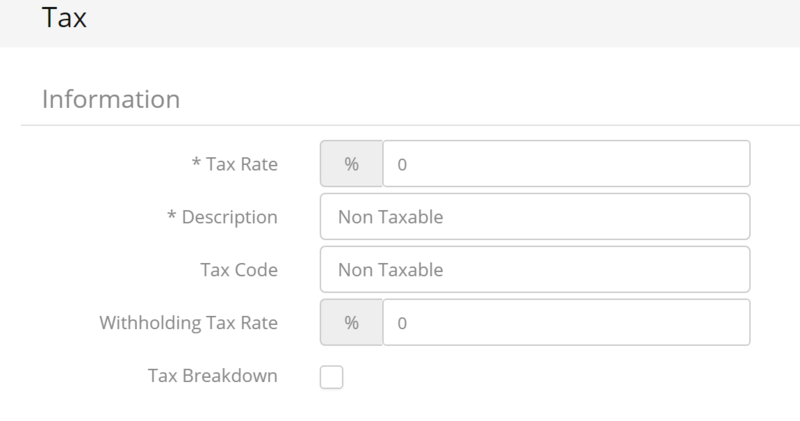 Select Tax Rate then configure your tax. For example, we will match the zero tax rate, using 'Non Taxable' as a name. To match this tax with Operate, go to the Operate Settings > General > Organizations > Taxes. And edit the tax rate you need to match. Paste the Tax Name from Quickbooks into the Tax Code field and save. You will also need to set up the tax rates that apply to Operate Products. You can do this by going to Space > Products, then either mass updating a list view or editing individual products. Please make sure that taxes are added to Products before these are used on Operate licences. The tax will not apply if it is set up after adding the Product to the Licence, therefore your invoices will not include tax upon export. Please follow the same process to also map the other taxes you want exported to Quickbooks. The Quickbooks Online Export requires that a Cost of Goods Sold account category type exist under Accounting > Chart of Accounts. This is needed in order for the export to work. In Quickbooks, go to Accounting > Chart of Accounts, in the main menu on the left. Under the Type column, look for Cost of Goods Sold. This category should be in Quickbooks by default, but if you are unable to see a category type called Cost of Goods Sold you will need to create it by clicking New at the top of the chart. Go to Operate’s Settings > General > Organizations > GL Codes. Please be aware that Operate uses a hardcoded GL Code called 'Bank'. This is due to the fact that when your customers pay using your Portal, all such payments are automatically sent to this code. This GL Code may be updated, but not deleted; otherwise it can cause your export to fail. Since Quickbooks is limited to one GL Code for payments (e.g. 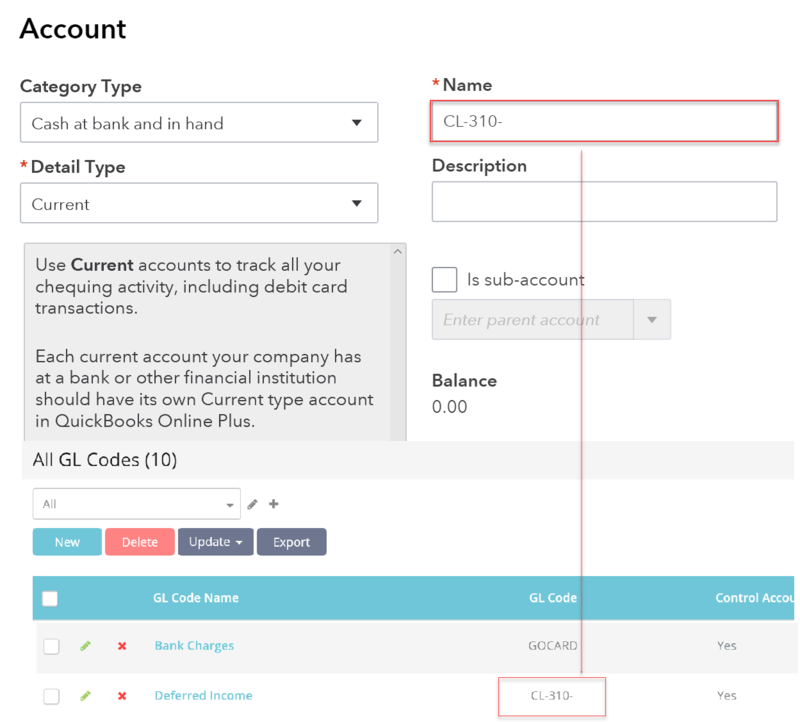 Undeposited Funds), you may not be able to use multiple GL codes to account for different types of payments; even though Operate provides this possibility. In this case, it is recommended to use the 'Bank' GL code to map your payments to Quickbooks. The default code is CA-275; however, you can update it to the one you prefer, BEFORE running your export. Once updating the GL Code, your history should update as well. 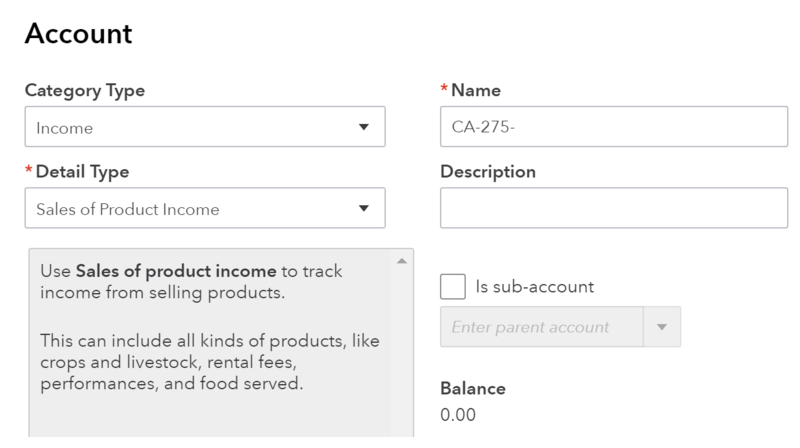 Each product you have in Operate will need to be assigned a GL Code that will determine where the income goes in your accounting. This GL Code will need to be added to Quickbooks as an Income type account so that the two systems match them during export. You may for example send your product sales funds to the 'Other Income' GL Code - CA-275- in our case. (This again can be a description the code as above). 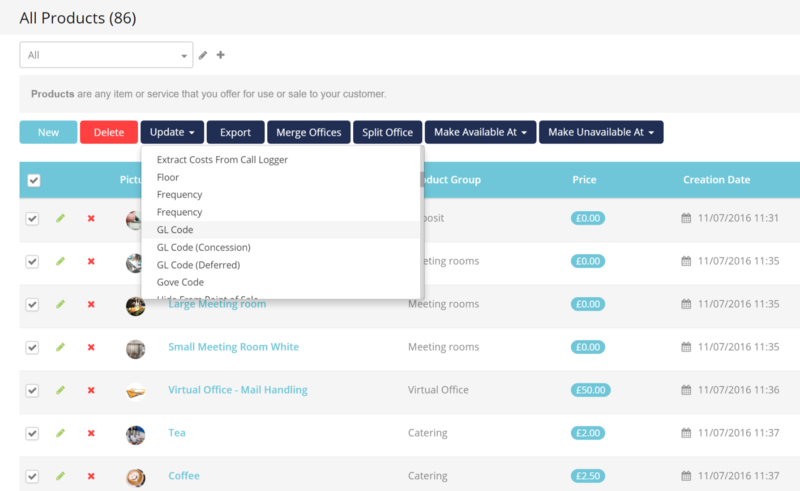 In Operate, go to Space > Products and add a GL Code to each of the products you want exported to Quickbooks. You can use one GL code for all of your products or several codes - one per product category. You can easily update several products at a time using the quick update option at the top of the list. List views make this easier. Do this for ALL of the product GL Codes that you want to export to Quickbooks. RELATED ERROR: If Product GL Codes are not configured, the following error will be displayed by Operate: Income type account with name: 'xxxx\ does not exist in Quickbooks. Quickbooks describes a company you invoice for services as a Customer. Operate describes it as an Account. Certain fields on the customer/account records must be mapped to reduce any errors occurring during the export. Your Operate Accounts are called Customers in Quickbooks and they need to match between the two systems so that your transactions are well assigned to the appropriate customer. Operate assigns an Account ID to each Account, which corresponds to the Company in Quickbooks. To match Accounts and Customers, the Account ID and Company need to be identical in both systems, therefore Operate will export this field to Quickbooks. However, you do need to check whether all of your Operate Accounts have an Account IO and add one for those that don't. You can this under Member > Accounts and use a list view of the Accounts created this month to do so (or look at all of your Accounts when running your first export). When mapping your accounts between both platforms its important to ensure that the account name is no more than 50 characters. In Operate, go to the Settings > General > Customize > Accounts. 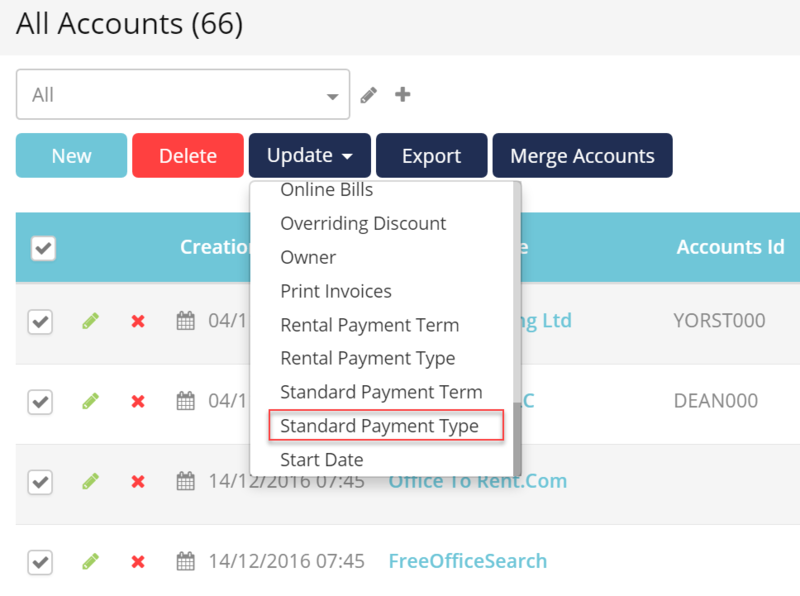 Select Standard Fields as highlighted above, then scroll to Standard Payment Typeand click into it. You will find a list of active payment types. Next, make sure that your Operate Accounts have a payment type assigned. 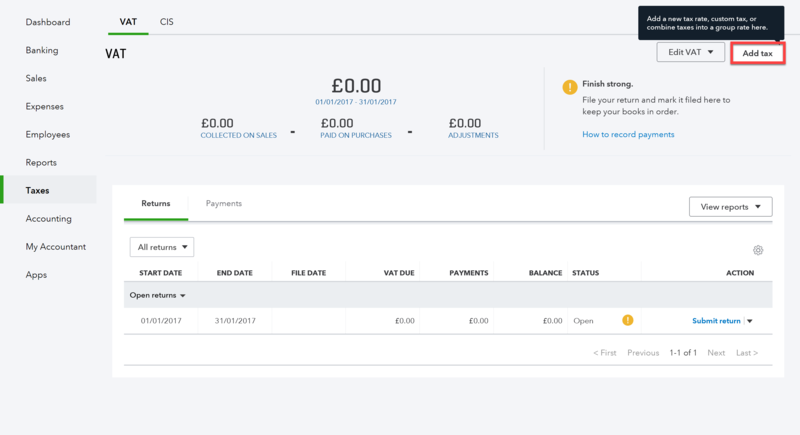 You can do so under Member > Accounts, where you can either mass update or edit individual accounts and add the payment type. 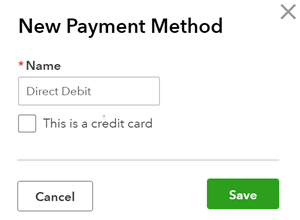 For each payment type, go to Quickbooks and click on the gear icon at the top right. Under 'Lists' select 'All Lists'. Select Payment Methods from your lists, then add all payment methods that exist in Operate but don't exist in Quickbooks. You can do so by clicking New at the top right. Enter the name of your payment method, check the box if it involves a credit card payment, then save it. Customer payment terms also need to match between your Quickbooks and Operate accounts. Go to Operate’s Settings > General > Customize > Accounts > Standard Fields. Now ensure that your Operate Accounts have a payment term assigned. You can do so under Member > Accounts, where you can either mass update or edit individual accounts and add the payment term. Select 'Terms' from your lists and add any term that exist in Operate but not in Quickbooks. Your goal is to match the list of terms between both systems here as well. You can add new terms by clicking New, on the top right hand side of your screen. You can edit existing terms by clicking the arrow in the Actions menu then Edit, or by simply double clicking. In Operate, go to Invoicing > Quickbooks Export. Select your organization, then click Export. If you do not see this option, go to Settings > Integrations and install the Quickbooks Export app. Next, select whether you need to export booked or un-booked transactions. Export un-booked transactions - These transactions would not have been exported.Export booked transactions - WARNING: These transactions may already be exported. Exporting booked transactions may lead to duplicates in your financial accounts. The only time when you should export booked invoices is when you are importing into a new, blank database. When you run this export, you will need to connect your Operate and Quickbooks accounts, therefore you will be asked to authorize this connection before the export goes through. Confirm that you want to run the export. It is recommended you backup your accounting system where possible before exporting. Wait for your export to go through, then check that it has run correctly. If there are any errors, please check that all of the above steps have been taken - make changes as needed then choose to export booked transactions. Only select the transactions that have failed and re-export them.